Most popular plugin among all internet marketers. Must have wordpress plugin for every affiliate marketer. You are probably heard about fact that over half of your traffic to your website, will actually leave your site within a few seconds and this traffic is just wasted, right ? What if there is solution that will help you to also monetize this leaving traffic off your site, well there is solution called Exit Splash plugin (but don’t worry if you are not running your site on WordPress platform, you will also recieve script that you can insert even into html page, if you purchase Exit Splash). 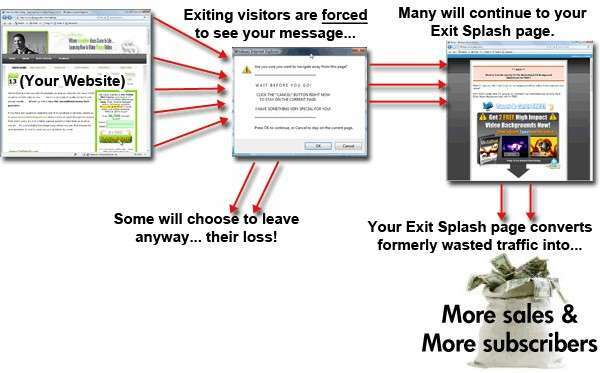 Almost every internet marketer is using exit splash script on their websites – in other words Exit Splash is incredible popular these times, because it just works as described. But it is really worth it to install Exit Splash on your website ? Well it depends on your niche and I want to talk about that in this exit splash review. Basically in this Exit Splash review I want to talk about all functions that this exit splash wordpress plugin has and also what you can expect if you decide to give it a try. Also I prepared my own video Exit Splash review so you will exactly see how it works in real time and what you can really expect if you install it on your site. So there is my honest exit splash review ..
First I want to tell you that if you have any questions about this plugin (and I can bet that you have) you can anytime contact me (email, sms or just leave a comment below this review) and I will try to assist you. So how does this plugin works ? If you install it on your website and visitors will try to leave your website or close the browser, it will automatically show them popup and redirect them to your affiliate page, optin page or whatever you want. So imagine that you have product and visitor will try to leave your page without purchasing, with exit splash you have another chance to monetize this traffic and offer them for example free report in exchange of their email, so you can sell them your product later. But it is only about you how you will going to use Exit Splash on your website. But there are so many options, so you have to test it. Anyway in other words you will make more money for sure if you decide to monetize leaving traffic, no matter if it will be seo traffic, paid traffic or even direct traffic. Well if you want to see more informations about Exit Splash, I recommend you to check my video exit splash review below. I know that you may have questions – for example if it will work or not and so on. I can honestly tell you that there is 60 days money back guarantee that will help you to protect your investment into this plugin. If it will just not work at all or if you will be unhappy, you can recieve your money without any questions at all. It is like guarantee that it will work for you otherwise author will lose his money. 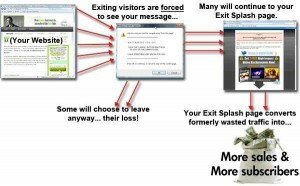 Also if you decide to purchase Exit Splash, you will recieve 10s of training videos how to optimize your exit splash campaign to the max, in other words they will teach you how to use it properly. Also you will recieve special bonuses for example templates, training videos as I mentioned and much more (more informations on the official website). 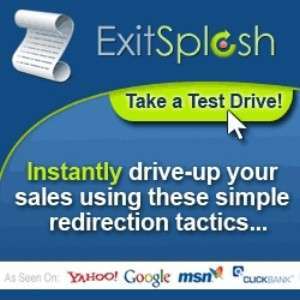 If you want to increase your optin list, sales or leads – exit splash may be the right solution for you, just give it a try and if it will not work for you, you will recieve your money back as I mentioned earlier in this review. Also remember that this is very popular tool among all internet marketers and there must be reason for that. Anyway I hope that this Exit Splash review helped you to make the right decision for your business and also I hope that you found at least this Exit Splash review helpful and useful.